Description: This cute puppy is injured and needs you to take care of him. Can you please help this cute puppy and make sure he gets all better? 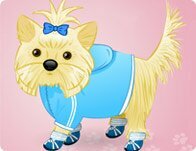 Dress up your cute puppy with these outrageous animal outfits!